It is estimated that each year at least one quarter of the population has symptoms related to stomach, but less than 10% of those seek medical help. In this paper we discuss only the symptoms related to diseases of the stomach. Read more to learn about other causes of abdominal pain. To understand some of the diseases and symptoms of stomach it is necessary to know a little of the anatomy and functioning of this organ. I will be brief in this description not to be dull. 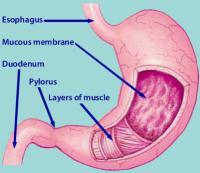 The stomach is a muscular organ, hollow, elastic, able to expand to receive the food. The stomach is located in the left upper quadrant of the abdomen. 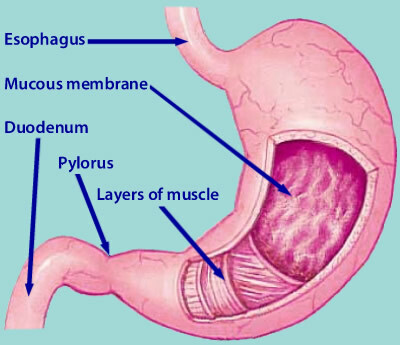 When you swallow food, it goes down the esophagus and gets into the stomach. Between the stomach and esophagus there is a sphincter, a kind of valve that prevents the return of the food back into the esophagus, even if the patient is upside down. The stomach secretes hydrochloric acid and digesting enzymes, especially proteins contained in foods. Contrary to what one might imagine, there is almost no absorption of food in the stomach, just a bit of simple carbohydrates and amino acids. The role of the stomach is digesting, or breaking large molecules into smaller molecules so that they can later be absorbed in the intestines. The stomach is a muscular organ, capable of contracting, aiding in digestion and passage of food to the rest of the digestive tract. Dyspepsia is a term that comprises a number of symptoms related to stomach. 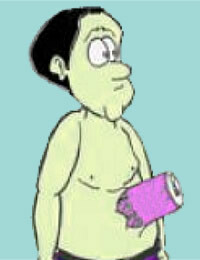 Dyspepsia is generally associated with patients often refer to as indigestion. Among the symptoms that are included in the term dyspepsia, there are: burning or pain in the stomach, feeling of fullness after meals, feeling distended stomach, excessive belching, heartburn, early satiation (you cannot eat a dish without feeling full before finishing it), nausea and a feeling of indigestion. Dyspepsia is usually associated with paintings of gastritis or gastric ulcer, but even diseases outside the stomach can cause it, such as irritable bowel syndrome, biliary colic and esophagitis. Dyspepsia may also be caused by medications such as anti-inflammatory and some antibiotics. Let's talk about some of the major diseases that cause stomach symptoms. 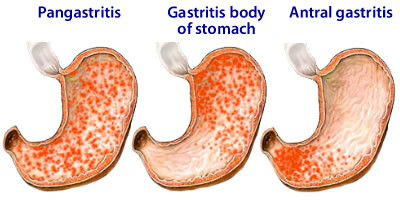 Gastritis means inflammation of the stomach. Gastritis can be acute, when it develops rapidly, or chronic, when the inflammation settles slowly and persists for several months. The acute gastritis is usually caused by alcohol, anti-inflammatory and food poisoning. The chronic gastritis is often caused by infection by the bacterium Helicobacter pylori. 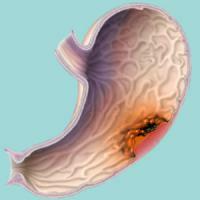 The most common symptom of gastritis is burning in the "pit of the stomach." Gastritis can improve or worsen after eating. Each patient reacts in a different way to dining. A burning stomach is the most common symptom, but any of the symptoms encompassed in the term dyspepsia may arise in a patient with gastritis. The gastritis if not treated can develop erosions of the stomach mucosa, leading to the formation of ulcers. Peptic ulcers are those caused by the action of hydrochloric acid on the wall of the duodenum, stomach or esophagus. The two major causes of ulcers are abuse of anti-inflammatory and infection by the bacterium Helicobacter pylori. The symptoms of peptic ulcer usually occur when the stomach is empty. After a meal, the food remains in the stomach for two to three hours. However, stimulation of acid secretion persists for up to five hours, namely periods in which the stomach is already empty. This is the time when it begins to cause the ulcer symptoms. The symptoms of peptic ulcers can also occur during the night, usually between 23h and 2h, when a natural stimulation of acid secretion by the stomach happens. Characteristic ulcer symptoms improve after the patient eats some food. As in cases of gastritis, ulcers usually cause a burning or pain in the stomach region, however, any symptom of dyspepsia is possible. Dyspepsia periods, lasting several weeks and alternating with periods free of pain for weeks or months, is a characteristic of peptic ulcers. Pain intensity in the stomach is not sufficient to distinguish gastritis from an ulcer. The ulcer is not necessarily the most symptomatic of gastritis. The gastroesophageal reflux disease (GERD) occurs when the sphincter that separates the stomach from the esophagus is incompetent, allowing reflux of gastric juice, extremely acid, into the esophagus. The most common symptoms of GERD are heartburn and regurgitation. It should be suspected in all patients with reflux dyspepsia, heartburn or regurgitation that are present as chief complaints. Stomach cancer is an uncommon cause of dyspepsia. However, in patients over 45, especially if they are smokers and patients with the bacterium Helicobacter pylori, this diagnostic possibility should be taken into account. 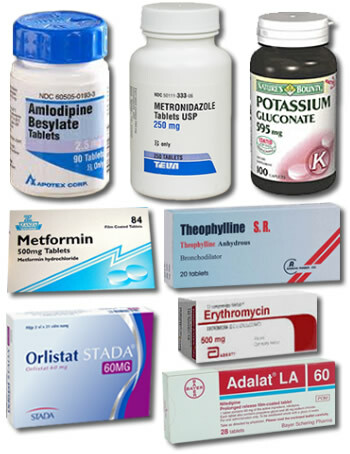 Some medicines can cause dyspepsia or worsen the symptoms of already existing dyspepsia. Drugs like Aspirin (ASA) and other nonsteroidal anti-inflammatory drugs can cause injury directly through the stomach wall, leading to acute gastritis by dyspepsia. Various other drugs have been implicated as a cause of dyspepsia as digoxin, iron, calcium channel blockers (e.g. Amlodipine and Adalat), theophylline, steroids, metformin, alendronate, orlistat, potassium supplements, acarbose and certain antibiotics, including erythromycin and metronidazole. Many herbal medicinal products known as "natural herbs" can also cause stomach symptoms, among the most famous is the Ginkgo biloba. Alcoholic beverages and smoking are also causes of dyspepsia. Functional dyspepsia is the name given to the chronic dyspepsia without identified cause. This is the case of patients who have symptoms that medical research is not able to explain. The patient has stomach pain but cannot find the cause even after extensive research. Treatment of dyspepsia should be focused on their cause. 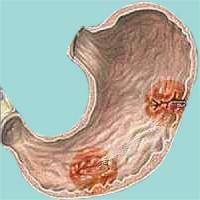 Upper endoscopy usually distinguishes the various gastric diseases that cause symptoms. The proton pump inhibitors are drugs which act by reducing the secretion of stomach acid. The best known are omeprazole, pantoprazole, esomeprazole and lansoprazole. These are indicated both in the medical gastritis, ulcers as at reflux and even in functional dyspepsia. Antacids can also be useful. In patients with H. pylori, the bacteria treatment can improve symptoms, even in patients with functional dyspepsia, gastritis without signs. However, not always the bacterium is responsible for many dyspepsia and maintain patient symptoms even after removal thereof. One should avoid use of anti-inflammatory drugs or any other medication that causes stomach symptoms. Those who smoke should stop. In patients with a history of depression or anxiety, the treatment of these diseases helps improve dyspepsia. 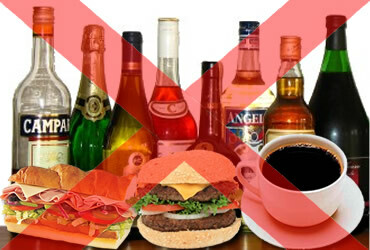 Regarding diet, you should avoid fatty food, coffee, soft drinks and alcoholic beverages. Losing weight for someone who is overweight or obese is also important. Avoid large meals too. Ideally eat less, but more frequently (5 or 6 times a day) to avoid leaving an empty stomach for several hours. If you have heartburn, avoid lying down soon after eating. At least 1 hour interval is desirable.